My first Mosaic Monday entry. Who knows, it could be my last [probably not, but it may be several more weeks until I get the chance to shoot another collection]. Yesterday morning, at -13degF, it was SO cold that all the moisture had been sucked out of the frigid air and crystallized itself on every exposed element outside. Of course, such cold temperatures are a result of high pressure air systems, which means abundant sunshine and - beautiful, shimmering trees, flower stalks, even mailboxes. So I ventured outside to take pictures of all the sparkling beauty around me. 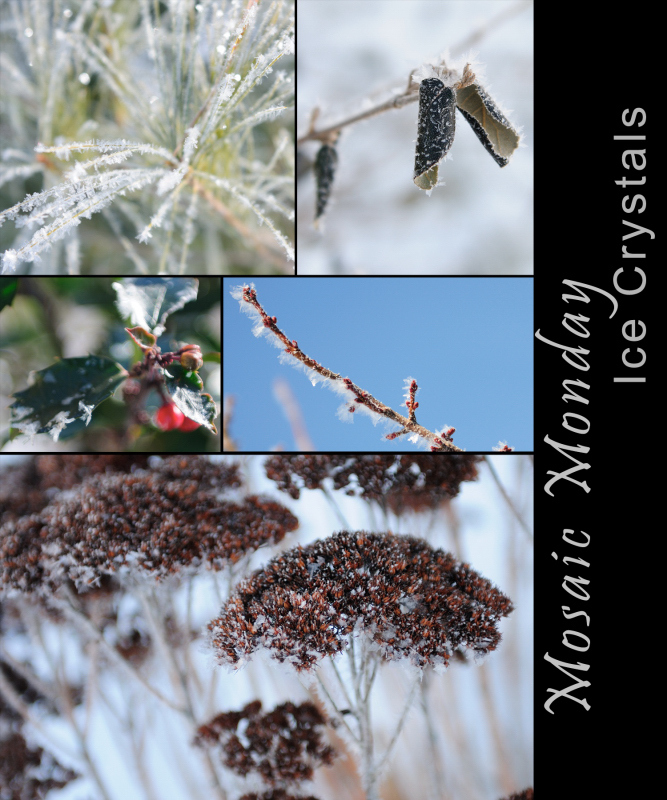 When the winds kicked up, many of the ice crystals were swept in the air, causing the air to glimmer. It made being outside bearable. For the mosaic, I modified a storyboard template from Rita at CoffeShop Photography. Rita's free tutorials, storyboards and actions are top notch. I've learned so much from her and you should check her website out. For more Mosaic Monday, please visit Mary at Little Red House. And stay warm - a "heat wave" up to 30degF is coming! Really lovely!! You did a great job on your first mosaic! Beautiful! I hope it won't be your last..it's really good!